Elders from South East and South West of Nigeria has called on President Mohammadu Buhari to restructure the country and practice true federalism. 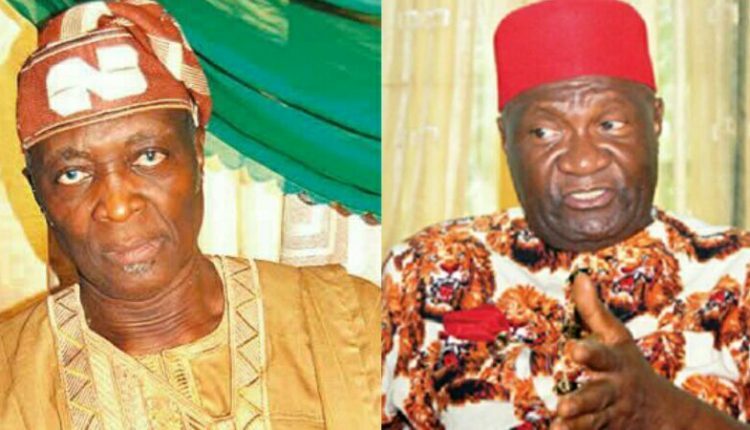 As contained in different events, Igbo leaders on Sunday reiterated their commitment and determination to accomplish their desire for the restructuring of Nigerian nation to guarantee equity and justice. The delegation was led by Senator Ben Obi and included former governors Achike Udenwa and Okwesilieze Nwodo, Senator Azu Agboti, pioneer Chairman, Niger Delta Development Commision, Chief Onyema Ugochukwu and former ministers, Chief Dubem Onyia and Professor Alphonsus Nwosu. Nwosu said, “The delegation was proud that the principled stand of Ndigbo on restructuring was galvanised by Ohanaeze Ndigbo under the very capable leadership of the President General and this resulted in the massive turnout of Ndigbo at the last general elections not only in the South East but throughout Nigeria and vowed to assist the President General to ensure that Nigeria shall continue to feel the weight of Igbo votes until restructuring is accomplished, and those who continue to ignore Igbo votes in Nigeria do so at their risk. The delegation pleaded with the President General to ‘ignore the activities of a few Ndigbo to sabotage the collective Igbo view’ since the Igbo votes strongly endorsed his position, but frowned ‘seriously on the sell-out of Ohanaeze Ndigbo by the Secretary General of Ohanaeze Ndigbo’ and urged that he should be strongly sanctioned. The Igbo leaders reiterated that the task of restructuring Nigeria into a nation that works for all its citizens and not just for only a section of its citizens, remained the top priority agenda of Ndigbo in Nigeria, and as the Igbo adage says, “the jaws do not rest until what is being chewed is finished,” the President General must ensure that this burning desire of Ndigbo for the restructuring of Nigeria continues to remain in the front burner of Nigerian politics. The task for Ndigbo now, according to the leaders, is to design the post general election agenda; to maintain Igbo solidarity such that the Igbo post-election agenda is not distracted by those lobbying for positions in government and those positioning to be president in 2023. “The Igbo wisdom of struggling for where to sleep before fighting for the mat to sleep on should guide our post-election strategy,” he warned. The Secretary-General, Yoruba Council of Elders, Dr Kunle Olajide, has urged President Muhammadu Buhari to ensure true federalism and national unity. Olajide told the News Agency of Nigeria that the President needed to return the nation to the era of revenue generation and not sharing of allocation. NAN reports that Olajide is also a retired medical practitioner and a traditional title holder in Ibadan, Oyo State. He said, “We have written a congratulatory letter to the President on his re-election and assured him of YCE’s support for his administration towards achieving a greater Nigeria. “In the letter, we told him that his victory carries enormous responsibilities, among which were the need to ensure national unity and a revisit of the Governor Nasir el-Rufai’s committee report on restructuring. The YCE leader said the nation could achieve rapid growth and development with true federalism which allows devolution of powers. He stressed that the decisions of the el-Rufai-led committee on restructuring set up by Buhari’s administration in 2017 was far-reaching, calling on the President to revisit the report. “They should then pay an agreed percentage to maintain few essential services in the centre such as Defence, Foreign Affairs, Immigration and Customs services,” he said. He said, “Today, there are 66 items on the exclusive list. The intervention of the military in 1966 truncated the march to true federalism. “So, in the next four years, Buhari should be able to finish the process, foundation and implementation of the el-Rufai’s committee’s recommendations. He also called on the President to make national unity a priority, urging him to ensure that all parts of the country were given a sense of belonging through appointments and projects. “We must ensure that people think of Nigeria before anything else, irrespective of ethnic and religious affiliation. The President must ensure that he bequeath a legacy of a united Nigeria. On the 2019 elections, he said that the nation had made some progress, adding that the conduct was better than those witnessed in the past. Olajide opined that the Independent National Electoral Commission should be unbundled from its overloaded responsibilities. He said the electoral umpire should only be responsible for the registration of political parties and conduction of elections. The YCE leader said civil security agencies, and not military, should play roles in elections, suggesting recruitment of more personnel to the police as well as the National Security and Civil Defence Corps to meet up with required number. “Let me confess. I am very proud of the Yoruba race. The outcome of the election gladdens my heart considerably because the political temperature was very high during the campaign season,” he said.